Home / Support / Documentation / RSFirewall! 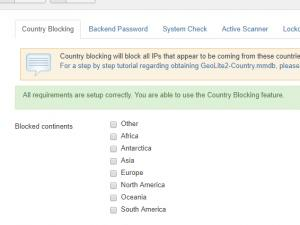 User Guide / Frequently asked questions / How do I use country blocking and where do I get GeoIP.dat ? This feature allows you to ban entire IP ranges of addresses that belong to a certain country. The feature can be accessed here: Components > RSFirewall! > Firewall Configuration > Country Blocking. After the database file has been downloaded, you will need to upload it via the Country Blocking management area and click on the Save button in the toolbar. 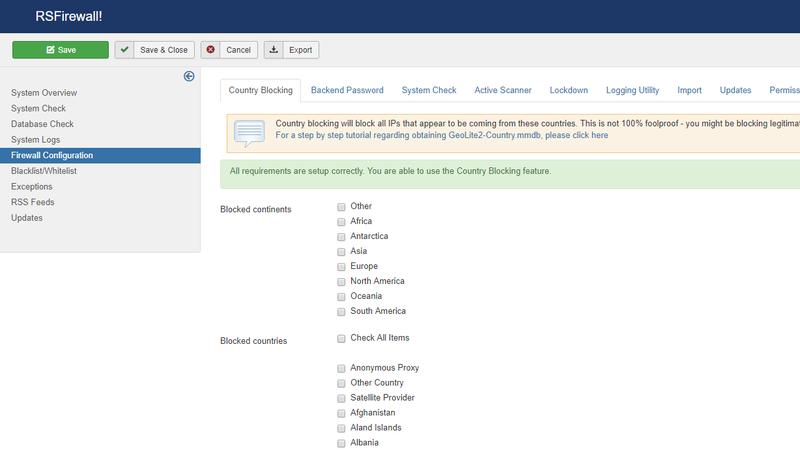 Once the database file is in place, you will be able to select which countries to block. If there's no upload button, it implies your server natively supports a geoip database and there's no need to perform these actions. 90 persons found this article helpful.